Nowhere in the literal interpretation of “baked brie” is the stipulation of a butter and flour-packed puff pastry. Sure, it tastes amazing that way, but I’m often greeted with exclamations of surprise when I pull my crustless brie out of the oven at a party or…at home for me and Steve, only two people, to devour together. I wanted to share my recipe for an entire wheel of basic baked brie on the blog not because it’s difficult or a secret, but because it’s one of those simple pleasures that I sleep better knowing the world can find on the internet. 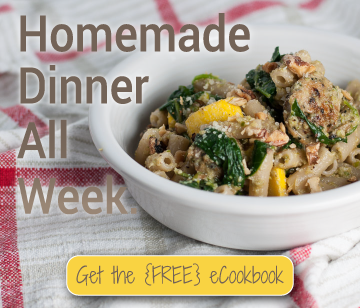 I really get the most questions about simple recipes like that. Then I started plotting when I could bake and photograph a wheel of brie for purposes of the blog, but everything I came up with resulted in half or more of the cheese getting thrown out. So if I want to eat baked brie but don’t have a crowd to serve it to and don’t want to admit to consuming puff pastry on a weeknight, are there other people out there with the exact same dilemma? I hope so. The combination of a deeply colored, slightly sweet, almost syrupy good balsamic and drippy baked brie happened to me nearly by accident. A couple Valentine’s Days ago (or maybe it was just last year? ), I planned dinner at home for Steve. He’s not historically been known as a V-Day enthusiast, but I wanted to have a special date night. The whole menu is over here. After one not-so-successful baked brie at a friend’s holiday party, I went for the double cream this time, and it paid off in the form of super easy dipping consistency and less time in the oven. On a whim/experiment, I hit that creamy pool with a splash of fig balsamic from my favorite local olive oil store and brought it to the couch with apple slices and crackers (and that prosciutto). Three minutes, 27 seconds later, it was gone. It was one big game of “okay, just one more bite”, until there were no bites left. It’s funny how things change in just a year. This year, no fewer than 40 days prior to Valentine’s, I received a calendar invite from my now-fiance for a V-Day surprise hot date (his words, not mine). What happened to the Hallmark holiday hater I once knew?? 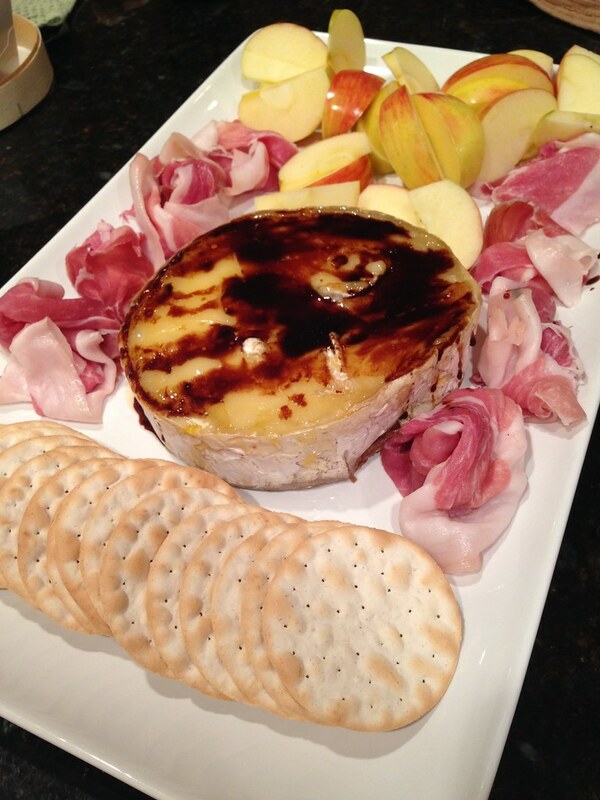 Whatever your plans for this year’s Valentine’s Day, make sure this brie is part of it. It works in any scenario: on the couch watching romantic movies with a glass of wine, as an effortless part of your pre-game for a slightly out-of-control V-Day girls night out (that would be me three years ago), or as a date night in app or dessert. But look at me carrying on about a made up holiday that’s three weeks away. That’s what happens when I stare at pictures of bubbly cheese for too long. What I meant to say is let’s not worry about next month, when there’s hot cheese pots to be made this weekend! Was this really not invented sooner? 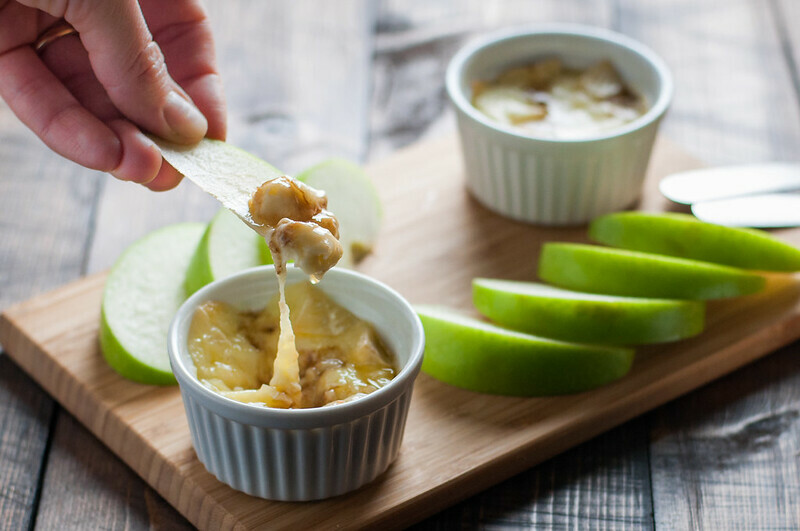 It's just as easy to make one serving of this baked brie as it is to prepare a slew of them as individual party appetizers, so you'll never again want for a warm, creamy, delicious snack with that Thursday night glass of wine. FOR THOSE WITH CELIAC DISEASE, YOU SHOULD CONFIRM CONCLUSIVELY WHETHER YOUR CHEESE IS GLUTEN FREE. 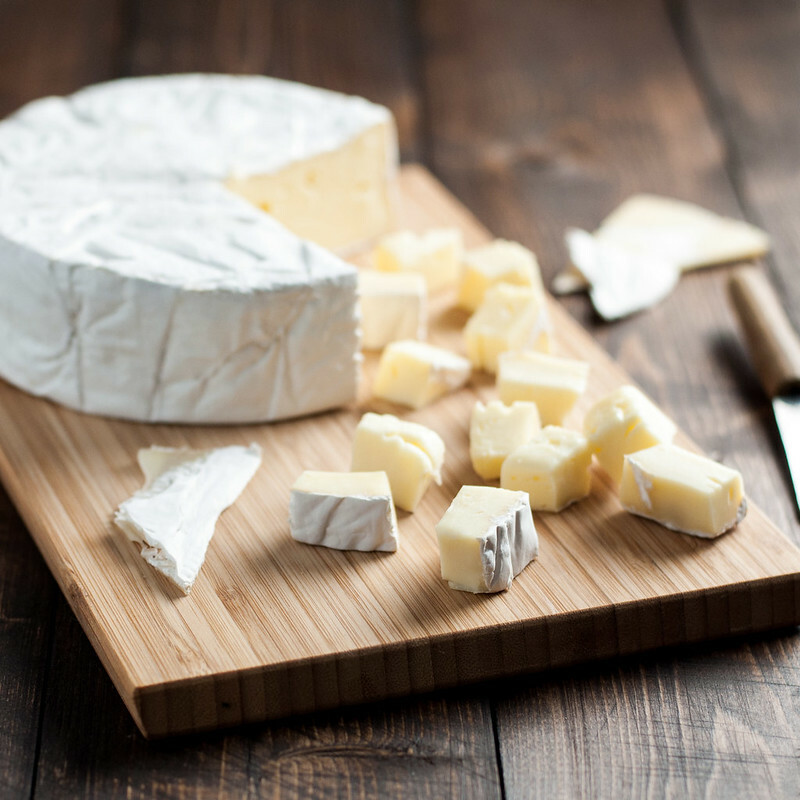 SOME BRIE CHEESE MAY CONTAIN TRACE AMOUNTS OF GLUTEN. Heat oven to 350 degrees (F). 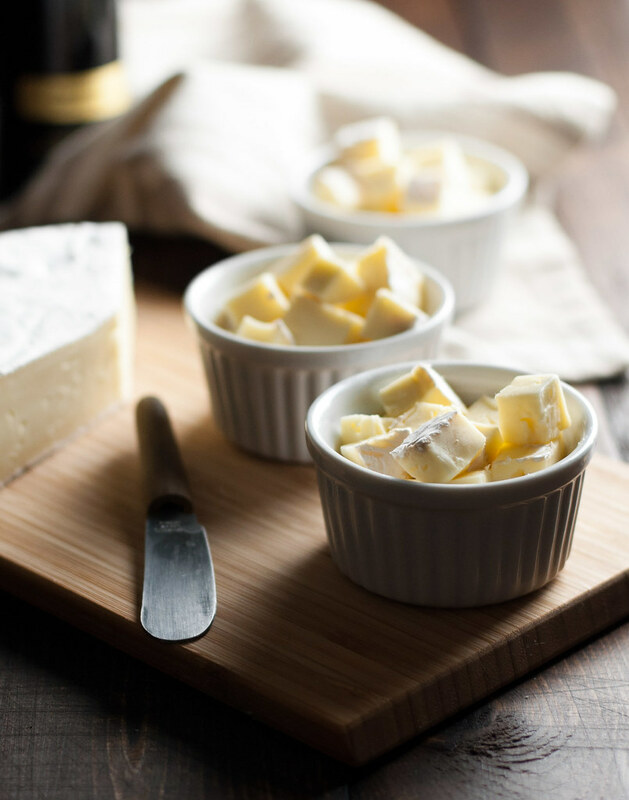 Cut brie into ½ inch chunks and pile into a ⅓ to ½ cup ramekin. Place on baking sheet or in an oven safe dish for easier handling and to catch drips. Bake on middle oven rack for 10 to 12 minutes, until cheese is fully melted and bubbly. Cool for just a moment, then drizzle balsamic over the top. Handling the dish carefully (with a mitt, clean, dry dish rag, or by placing it inside a slightly larger dish), consume immediately, while still hot and gooey. The size of your dish is not so important. If your dish is larger and only partially filled, it’s still highly edible. You can also cut the serving size even further for a tiny treat if you’re watching your cheese intake. Reduce the cheese to an ounce, use a small prep dish if you have one, and reduce the baking time to just until the cheese is bubbly. If time permits, cut the brie into cubes then let it stand at room temp in the dishes for 30 minutes to an hour. It will bake even faster. In all this fuss about a gluten-free, anytime, mini baked brie, I forgot to share my method for the full wheel, which some of you may be interested in if you’re hosting a large gathering. So here it is. My method for a simple, crowd-pleasing wheel of baked brie, sans pastry. Preheat oven to 350 degrees (F). With a long, serrated knife, slice off the top circular rind of the brie, keeping it as intact as possible. I insert the knife point halfway from the edge to the center, place my hand on top of the wheel so I can feel the knife placement, then rotate the handle around the circumference of the wheel. Keep the unattached top rind on top of the brie, and place it in a pie plate or other circular, rimmed dish, leaving a little room around the brie. Bake on middle oven rack about 20 minutes, lifting the top rind just a bit to see if it's creamy all the way through (it usually bubbles as well). Remove from oven and use a large spatula to carefully transfer to a bowl or other serving dish that won't burn guests (do not serve it in the dish you baked it in!). Slowly peel off and discard the top rind. 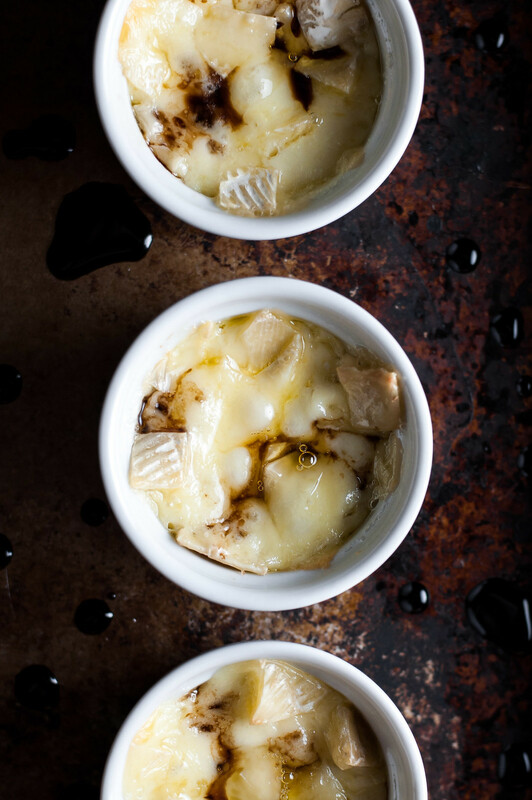 If desired, drizzle hot brie with balsamic vinegar, then serve with a utensil for scooping. 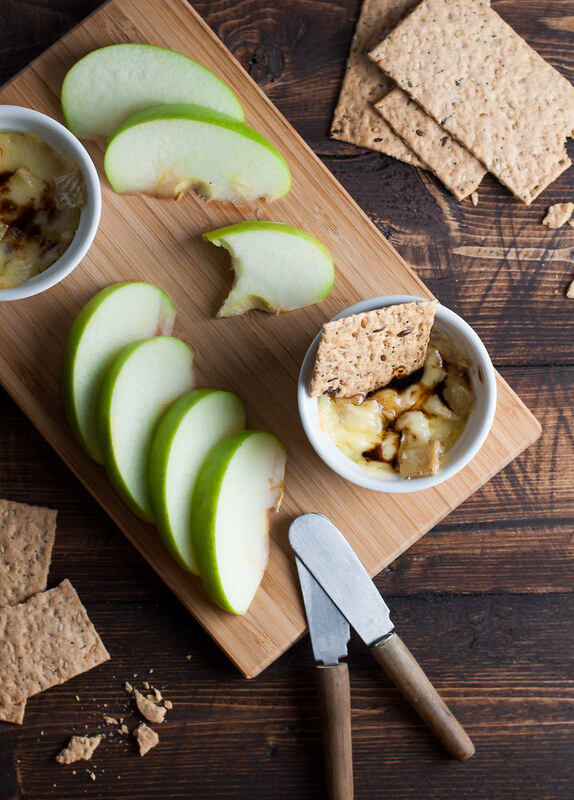 Baked brie is just so delicious with fresh fruit to dip in. This makes me feel all warm and cozy. Love the sharp contrast with the balsamic––so nice! Thanks! Definitely looks AND tastes better with the balsamic. i found your recipe on foodgawker and it sounds great — I’m really looking forward to trying it. However, I did want to point out that Brie itself is not gluten free. The rind is made with flour, so if you serve it to someone who cannot have gluten, it can have some not-so-desired results. My sister is celiac and found out the hard way after digging into a cheese plate one night. Elizabeth–thank you! I had no idea…I guess I just assumed as your sister did that it was gluten free. I’ll look into it and update the recipe. Enjoy! I just did some research on this. From what I found, most brie cheese SHOULD be gluten free, but there are definitely reports of some with Celiac having problems with it. While the rind isn’t actually made of flour, the mold spores or bacteria used in the cheesemaking process (and rind formation) may have come from bread. Thanks again for the heads up–I’ve added a clear note to the recipe!